You can now import courses along with course grades, course schedule, course fees and course faculty under Courses -> Importing. 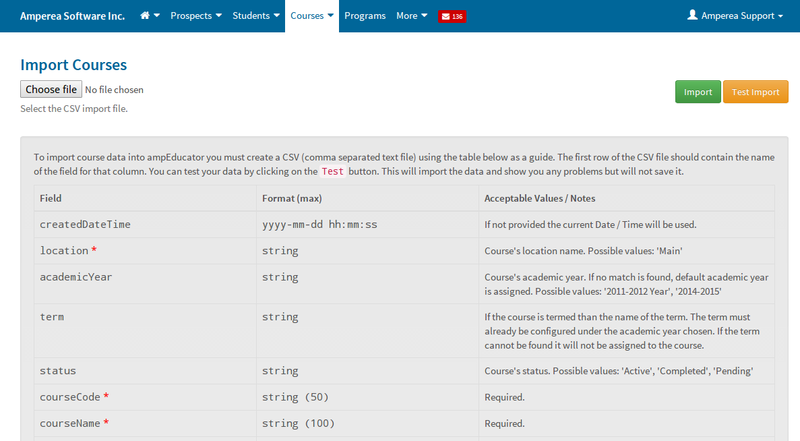 To import courses you must create a csv file using the column definitions as outlined on the course import page. You can also test your imports by chosing your import file and clicking on the 'Test Import' option. This will provide you with a list of warnings / errors which you can fix prior to importing your data. Several years ago we added some basic library functionality to allow schools to keep track and manage their libraries. However we've found that there is very little need for this functionality and developer resources can be better served maintaining and improving the core features of ampEducator. If you have any comments or questions please email us at support@ampeducator.com.